Midlands Crimestoppers is a nonprofit 501(C)3 organization which relies on community donations and fundraising for operational needs. 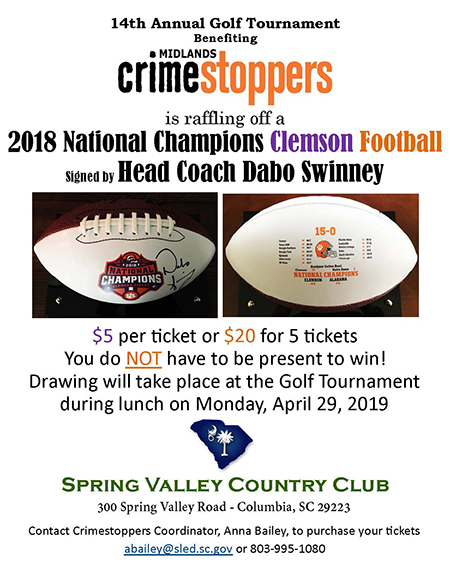 NO TAX DOLLARS go to support Crimestoppers in SC. All donations are TAX DEDUCTIBLE. You can help make a difference by supporting Midlands Crimestoppers with a donation. Donations can be made through PayPal by clicking donate or mailing a check made payable to: Midlands Crimestoppers or Crimestoppers of the Midlands. (Address listed below) All corporate sponsors' websites and information are displayed on the Sponsors page according to level of sponsorship. 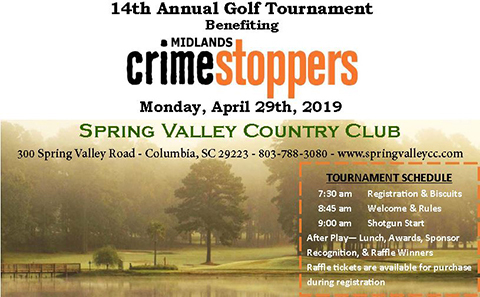 Midlands Crimestoppers is participating in the Midlands Gives 18 hour giving event on May 7th, 2019 hosted by the Central Carolina Community Foundation! An online giving platform has been setup at MidlandsGives.org with searchable profiles of participating nonprofits. All donations will be processed through the Midlands Gives website, which allows nonprofits and donors to track the giving on May 7th via the site's leader boards. Please consider making a donation on May 7th! Shop at smile.amazon.com/ch/57-0736215 and AmazonSmile donates to Crime Stoppers of the Midlands Inc.
Amazon donates .5% of the price of your eligible AmazonSmile purchases to the charitable organization of your choice. AmazonSmile is the same Amazon you know. Same products, same price, same service. Support Crime Stoppers of the Midlands by starting your shopping at smile.amazon.com.